Half a block from the factory where Henry Ford built his famous moving assembly line a century ago is a little hot dog shop called Red Hots. The auto plant started operating in Highland Park, Michigan, in 1913. Red Hots opened its doors in 1921, catering to tens of thousands of hungry Ford workers. 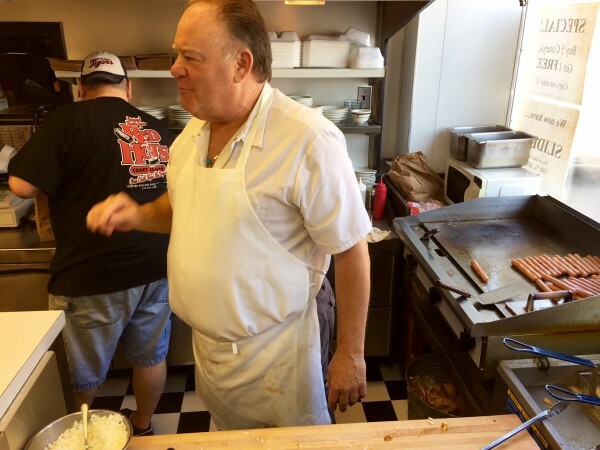 Back in the day, the grill at Red Hots was always full of sizzling dogs, and co-owner Rich Harlan (below) sometimes had to make two pots of chili a day to keep up with demand. "At eleven-o'clock a whistle would blow, and you knew within a few minutes those Ford employees would come rushing you," Rich says. "You would put two coney [dogs] in a bag and ... guys would run in, throw the money on the counter, grab a bag, and run." The specialty of the house? 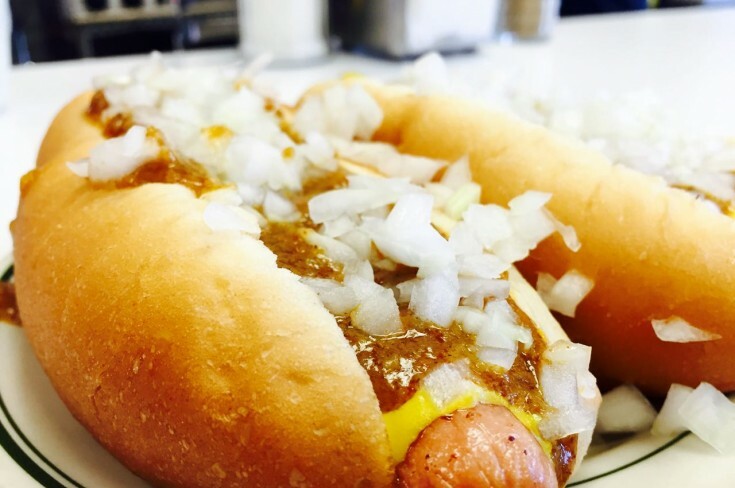 Coney Island hot dogs -- Michigan's iconic hot dog, topped with chili, mustard, and diced raw onion. But when the factory started cutting back and the economy stalled, things slowed down at Red Hots. "It was terrible…a lot of restaurant people that I knew had to close their doors," Rich recalls. 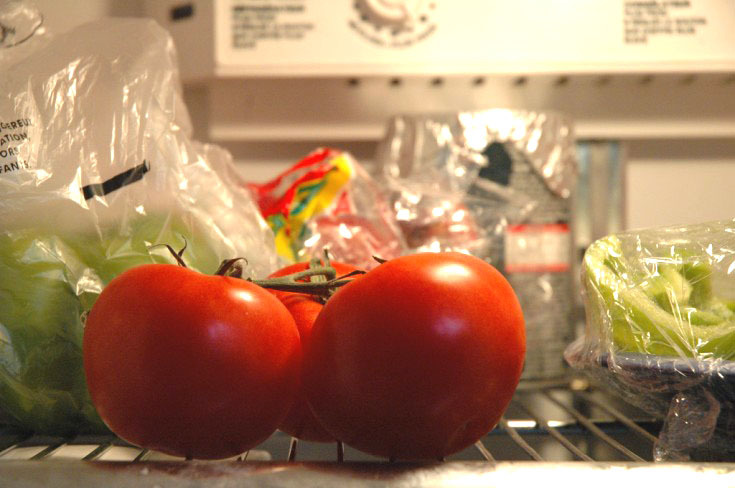 "I cut myself down to one paycheck a month." Listen in to the full episode to hear what kept Red Hots going during tough times and why Rich isn't sure he wants his own kids to carry on the family hot dog business. Rutt's is famous for their deep-fried hot dogs -- known as "rippers." 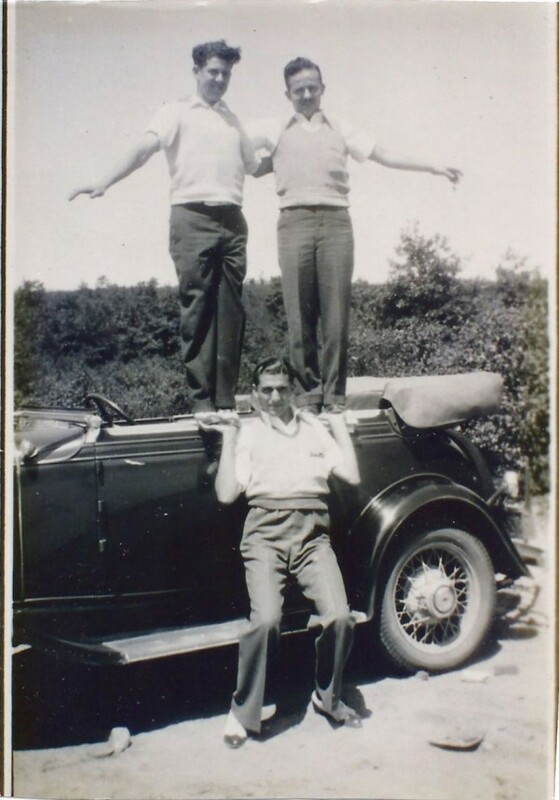 It's also a place Dan's grandfather (below center, in Rutt's parking lot in the 1930's) loved to visit back in the day. Dan's father brought him there, and now Dan is carrying on that sacred tradition. 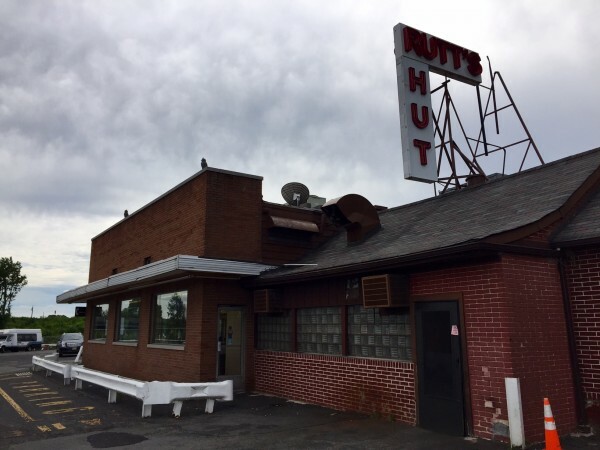 "Generation after generation, you take your kids to Rutt's Hut," Dan says in the episode. "When ... [a restaurant] has this history in your family, it's always gonna have a special place." 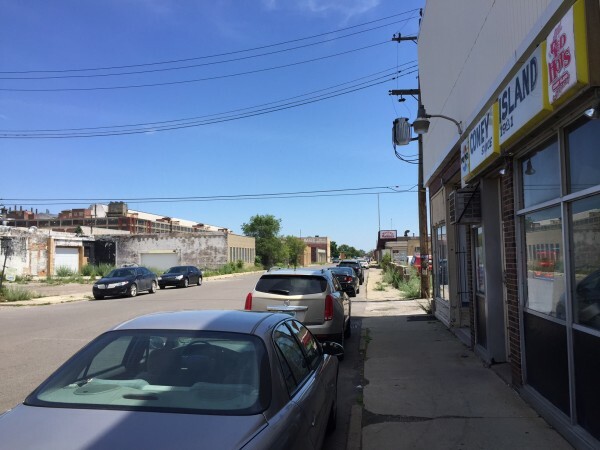 These days, it's harder for Dan to get there (it's a MUCH longer drive from Long Island), but for this episode he took his parents and his cousin Andy back to Rutt's to see how things have changed. "You bite into that ripper and it takes you back 50 years," says Bill Chrisafinis, whose family owns Rutt’s. "It’s a very homey feeling for people when they come here." 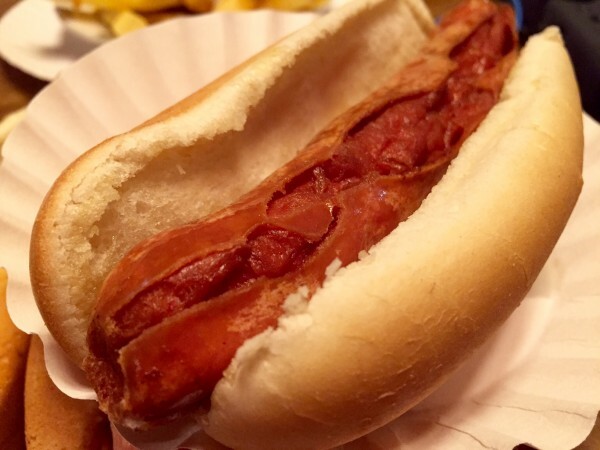 Listen in to the full episode to hear Dan and his family's take on the deep-fried dogs at Rutt's (below). Are they really still the same after all these years? 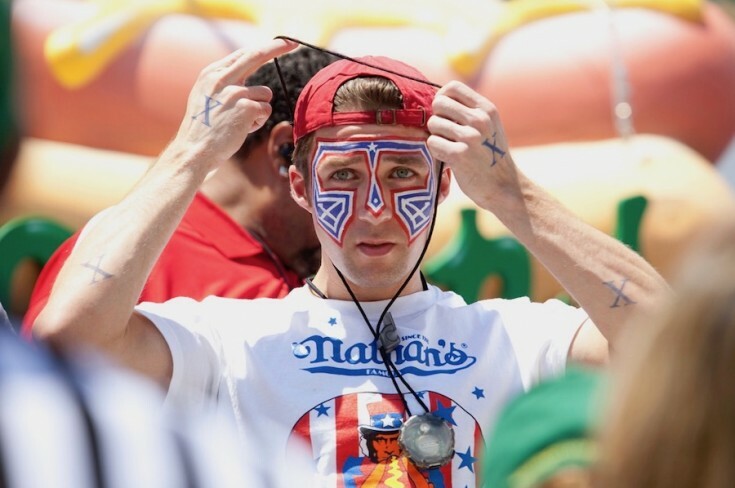 Plus, Serious Eats food science guru Kenji Lopez-Alt schools us on the science of deep frying hot dogs, and Dan's mom tells a shocking story of hot dogs and spousal neglect. Listen in! 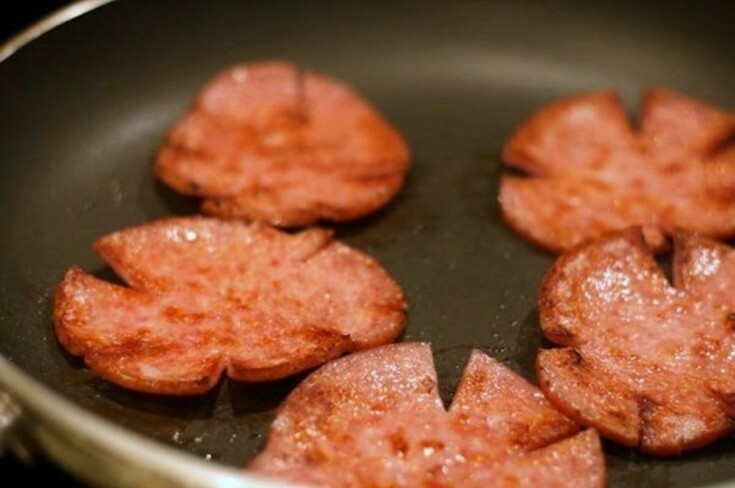 What is this iconic food? Why is it so important to the people of New Jersey? And why can't they stop fighting about it? We talk with comic Chris Gethard and many others to find out.